I was amazed to learn how Chinese culture extends to various indigenous cultures that are not as well known as the dominant Han people. Yunnan is home to many of ethnic minority groups. These consist of a fraction of a percent of the 1.4 billion people who are Chinese. Doubting that I would ever embark on a months'-long trek into the jungles and live along the tribes, I was lucky to get a chance to visit Kunming's ethnic village park. It is less of an amusement park and more of a mock village and museum where people from the various ethnic groups welcome tourists. The most cynical tourist would equate this to a human petting zoo. But I chose to see this as a great educational opportunity that I'd be foolish to miss. Here you can try specialty snacks, try their wine or tea, tour a model home, and chat with tribes' members to learn whatever you can with however much Chinese you know. English was not spoken. And of course, you can take as many pictures as you like. I was glad that I was not with a large tour group. I could have gotten lost in a place like this for three days. And as it turned out, I did return here on the last leg of my trip. I would sit and drink tea and just enjoy the late morning. 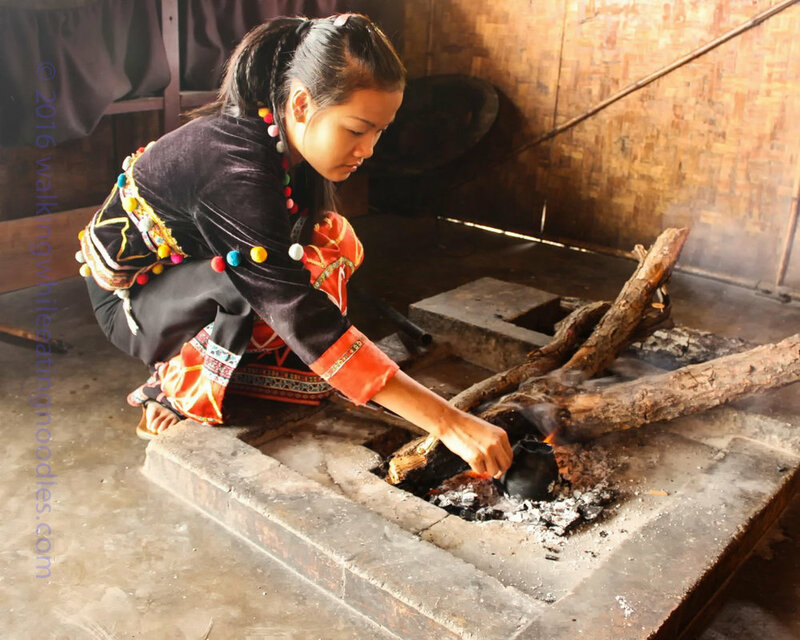 I watched how each tribal group prepared tea in a different and interesting way. I was not worried about trying to see everything that the park had to offer. I was interested in trying to have an authentic experience in a place that clearly was not authentic...except for the fact that these were real people who were really interested in sharing a little hospitality. There were just about as many ways to make tea as there were different villages. 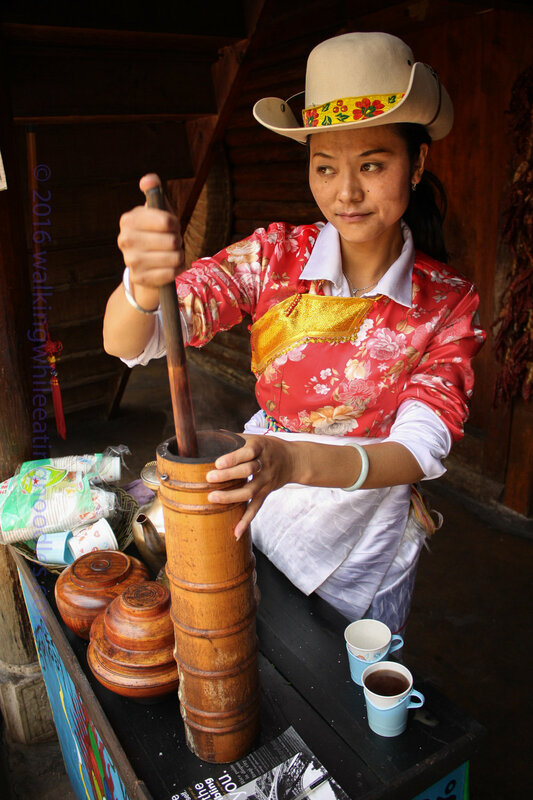 At the Tibetan village, I got to try yak butter tea. It had a sour taste rescued only by generous heaps of sugar. They also had peanut tea with crushed peanuts mixed with milk. One of my favorite experiences in China during my study abroad in 1999 was visiting Hangzhou and drinking tea on a farm in their tasting room on a cool rainy autumn day. As a poor student who was not eating much and trying to take in as much of the experience in China as possible, I savored that experience and the taste of the perfumed taste of that Dragon Well Tea. I loved drinking tea and in the five years I had worked in China before the Yunnan trip, I had been given so many different types of tea as gifts that I knew the differences between the major types. My favorite tea at the time was Pu'er tea which is the type that comes from Yunnan. Fermented until black and pounded with a stone into a disk weighing 250g, Pu'er tea looks more like something from a jungle heroin operation and not so much from a tea farm. It has always been packed that way to endure long travel out of the rugged mountains of Yunnan and reach the far corners of Asia where delicate teas have no business--Mongolia, Tibet, and the Steppe. Where most teas can be steeped 3 to 5 times with boiled water that had been allowed to cool for 5 minutes. Pu'er tea can be added to a roiling cauldron over a fire. For a cup of tea, the leaves can be reused 10 to 15 times. It is a good all-day cup of tea. Pu'er has a richer, earthier taste than most teas and is low in caffeine.